How much equity should startups give advisors? How much equity should early stage startups give advisors? As a general rule, early stage startups compensate advisors with 1% equity in the company. This amount varies according the advisor's expertise, role within the company, and the stage of the company. What kind of advisor are they? Board Advisors are usually experienced ex-founders or industry experts whose input is sought into the strategic direction of the company, and they are given a seat on the company’s board of directors to help shape the company strategy and decision-making. General Advisors are similar to Board Advisors, but do not sit on the board of a company. This does not indicate that they have less experience, but simply that they have less input over the strategic direction of the company. For example, an ex- Chief Marketing Officer from a different industry to the startup might be an invaluable General Advisor. Choosing to compensate an advisor with salary, equity, both, or neither will often come down to the preference of the individual in question. Yet that doesn’t mean there aren’t striking differences in the way in which the different advisor roles are compensated. For example, General Advisors are overwhelmingly compensated only with equity (81% of the time), whereas the advisor types get more of a mix between cash and equity. 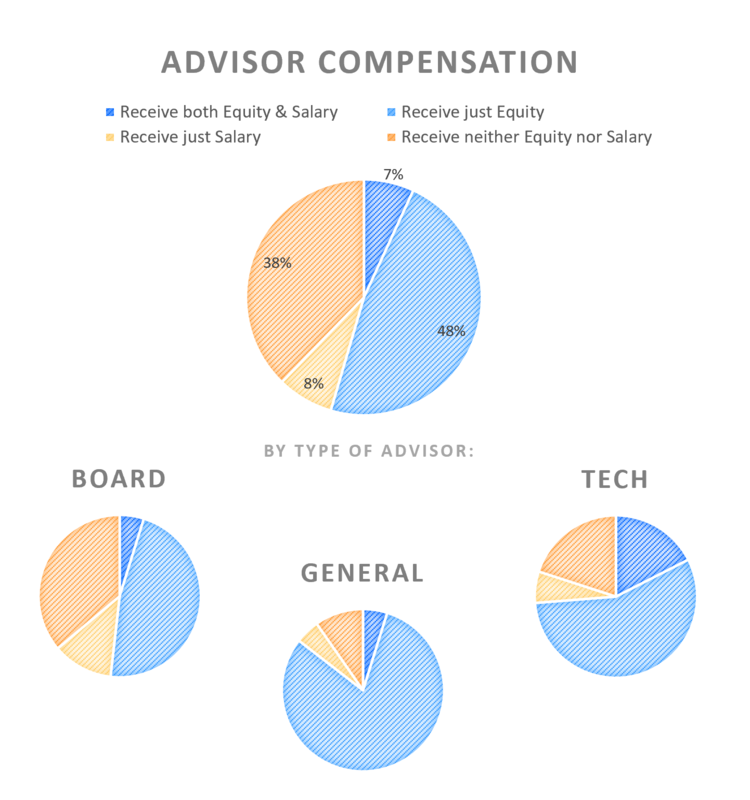 Tech Advisors are the most likely to be compensated with both cash and equity (18% of the time), and Board Advisors are the most likely not to be compensated at all (36%). We then took a deeper dive into the 48% of Advisors who receive just equity as compensation. We broke down the amount of compensation that they receive with respect to company valuation, days worked per year and advisor type to provide further insights. As would be expected, the higher the valuation, the lower the amount of equity an advisor should expect to receive. 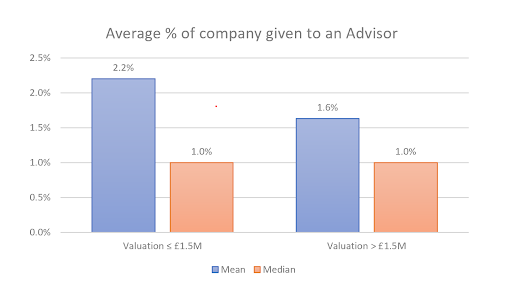 However, the fact that the median value is the same at 1% for both categories indicates that 1% is the most popular (modal) amount of equity to be given to advisors across a wide range of company valuations. Now this one surprised us! It seems that there is a very clear separation in the compensation for advisors who work more than two days a month and those who work less. Two days a month seems a tipping point - fewer than 2 days a month commitment may indicate an advisor being hired as a figurehead, someone to impressing on the company pitch deck or web site, someone who will actually contribute little real time (and in our view, little real value) to the company, whereas above 2 days a month indicate a ‘real’ time commitment - and as can be seen this commitment is suitably rewarded. 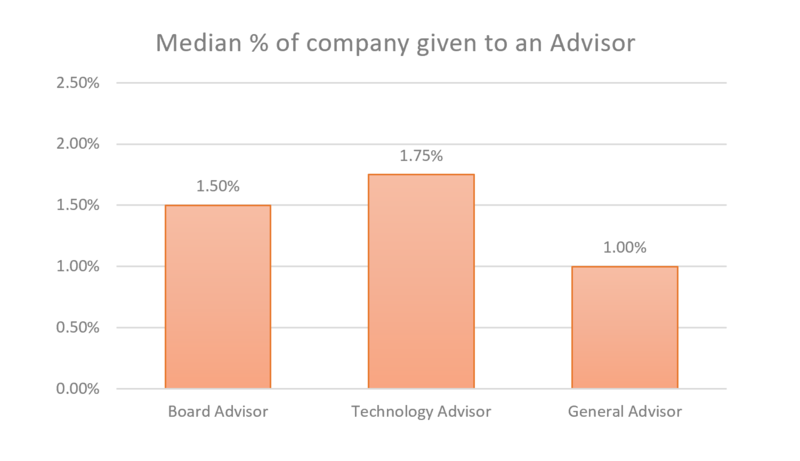 The result observed here is that General Advisors get less equity than Board or Technology Advisors. 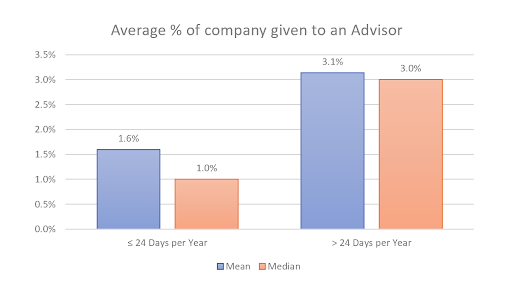 This may be because Board Advisors have a defined director position with corporate and legal obligations, and Tech Advisors work more days (on average 43 days a year) than the other advisor roles. Or, it may be simply that General Advisors are more often chosen as figureheads for the pitch deck and web site. We hope that these insights will allow founders to make a more informed decision when deciding on the level of compensation for the next advisor they hire, and potentially advisors to realise whether or not they are being compensated appropriately. If you have any questions about advisor or other hiring agreements (all included in the SeedLegals Base Plan) just hit the chat button, we’d love to help.